I am an outsider looking in. I do not know much about horses but I see a problem and want to solve it. My story starts in the beautiful town of Durango, Colorado on a snowy day in December. My wife and I are out shoveling snow and I hear a loud clanking noise coming down the street. I walk to the end of the alley and see the Christmas horse carriage coming. I could barely hear the family talking because of the slapping of the steel shoes on the slippery wet asphalt. As I am watching these gorgeous horses descend down the hill I see the outside horse slip and fall on its side. After a few failed attempts the horse was back on its feet. Then I started to ask myself a few questions. Could this have been avoided? Why do horses wear steel shoes? If shoes are the answer, why not something with more grip or that absorbs concussion at the same time? Why do horses wear shoes at all? It seems like barefoot is the way to go these days but there is a transition and rehabilitation period involved depending on the amount of internal damage of the foot. I have also read about people giving up because their hooves are too sensitive, particularly on rough and rocky terrain. So the steel shoes are nailed back on and off they go. I am an avid trail runner and I would be in some pain also if I walked on rocky terrain without some protection. My feet would also get beat up running around in shoes with steel soles. That is why hoof boots can help with this transition. We are out of the industrial age and into the information age. There is scientific proof that steel shoeing horses is not healthy for them. It weakens the entire hoof and structures. It does not allow proper contraction and expansion when weight bearing during movement which impedes blood circulation. It also does not help absorb concussion. I have seen and studied the destructive effects of steel shoes on horses and could never imagine doing such a thing. I do not suggest going barefoot just because it is trendy. I also do not suggest you to try on a pair of skinny jeans because it is the latest fad. It is not for everyone. My brother challenged me to try on a pair of skinny jeans when we were shopping a few years ago. I walked out of the dressing room like Tin Man and actually felt my toes going numb. It was not a good fit for me. I also do not want to badmouth people who do shoe their horses. I think most people are doing what we have only known or think is optimum. I am not going to sugar coat it but it requires some education, effort and commitment for this to work. We need to look at diet, lifestyle, living conditions, and trimming schedule. 1. There is way too much sugar in the diet. Horses are not meant to eat lush green grass or high starch feed. It would be the equivalent to me eating skittles all day, although it sounds fun. 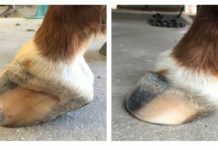 This can cause laminitis and hoof sensitivity. Horses evolved to eat dry sparse grasses. You will also need to ensure that the diet contains correct amounts of proteins and amino acids. 2. They need exercise and movement. I know we all do not have the convenience of having perfect pastures. If your horse is penned up all day in a tiny stall, it needs movement. It is critical to promote circulation in its hooves. 3. You do not trim often. If the hoof walls and heels are overgrown the sole is not going to get tough. Every 4-6 weeks is ideal. The importance of a correct and timely trimming cannot be overstated. Try to go 6 weeks without clipping your toe nails without peeling one back and you will understand. 4. Wet pastures. You will need to add some varied terrain (pea gravel) into the pasture or loafing area. They will never be able to fare well on rugged terrain if they only walk on soft ground. 5. Shod too long. There are a lot of horses that have been in shoes for decades, so they may never be comfortable. Boots are the best alternative in this case. We hear nothing but bad news all of the time and that the sky is falling. Things are changing for the better with EasyCare. 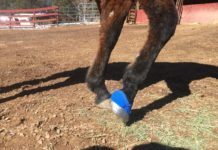 EasyCare is helping horses. We get amazing stories daily that inspire us. 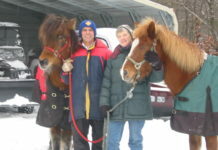 From helping suffering horses to completing 100-mile endurance races. I love to hear that what we are doing is impossible. Look around, everything you can see or touch was once impossible. We are an innovative company that will continue to develop products that provide comfort, support and performance for our equine partners. Again, I am an outsider looking in, but, surrounded by some amazing and intelligent people with some unbelievable technology. I came to EasyCare to help horses. I cannot tell you how important your feedback is so we can continue to be the leader in creating products to solve your problems.